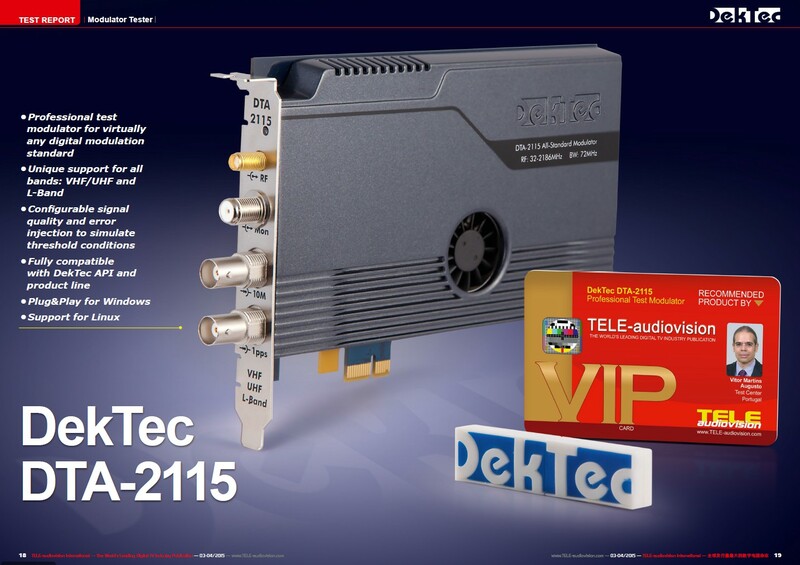 DekTec's highest-end modulator for satellite, terrestrial and cable standards, prepared for the latest standards such as ATSC 3.0. The DTA-2115 has a programmable output level up to 0dBm and exceptionally low phase noise. 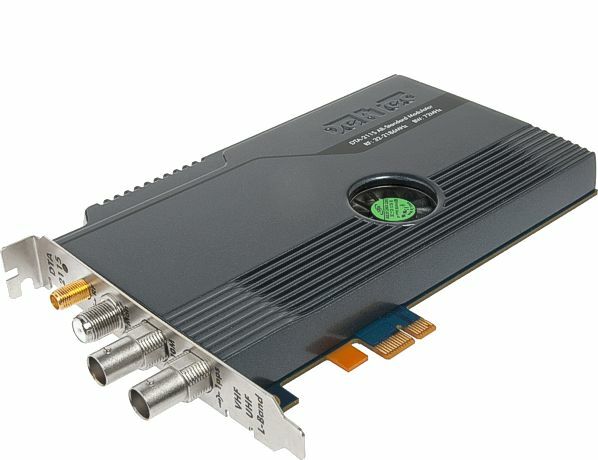 All-standard all-band modulator for PCIe with StreamXpress player software. All-standard all-band modulator for PCIe with all current and future modulation options, channel simulation and StreamXpress including remote control. The base version of the DTA-2115 supports the modulation standards listed under "Modulation standards" at the top of this page. Please refer to the Modulation Options page for all available options. Excellent signal quality through direct digital synthesis of the RF output signal and an on-board ultra-low phase noise oscillator. Can be used for wide-band advanced modulation schemes, such as 16-MHz multi-segment ISDB-Tmm, DVB-S2X and 64-MHz DVB-C2 channel bonding. The DTA-2115 reads data from the PCI Express bus and forwards it to a baseband modulator, a channel filter, an optional channel simulator and an upconverter. The digital RF signal is converted to analog with a high-speed D-to-A converter and output on a main and monitor output. PCI Express modulator with L-band output for satellite standards DVB-S, DVB-S2 and ISDB-S. For DVB-S2X the DTA-2115 or DTU-315 is required. The DTA-2107 is a low-profile card, while the DTA-2115 is standard-profile PCIe card. If you only need satellite modulation and no DVB-S2X, then the DTA-2107 is a cost-effective alternative to the all-standard DTA-2115. PCI Express modulator with VHF/UHF output for cable and terrestrial standards. The DTA-2111 does not support satellite standards, nor will it support ATSC 3.0. The DTA-2111 is a low-profile card, while the DTA-2115 is standard-profile PCIe card. Compared to the DTA-2115, the price point of the DTA-2111 is very attractive, making it an excellent choice for OEM applications. A portable variant of the DTA-2115: Easy to install and easy to carry to demos and around the lab. Like the DTA-2115, the DTU-315 uses an all-digital modulation and upconversion architecture. However, as the DTU-315 is bus powered, the DTA-2115 has the best specifications for output level (0dBm vs -25dBm) and phase noise.